It’s good to spend time with a single, really fine piece, letting it sink in. 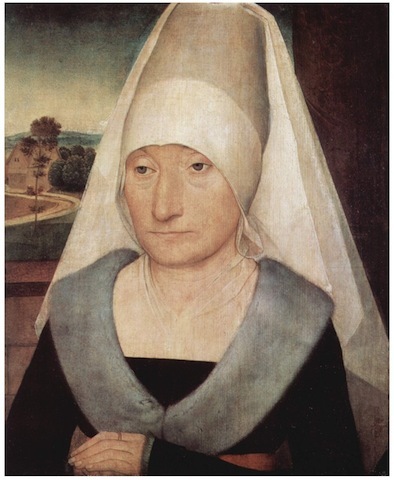 “Old Woman” by Hans Memling (1430 – 1494) repays that attention. Neither pose nor costume are unusual. 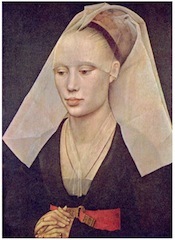 Van der Weyden and others did very similar pieces–pose, headdress, hands, red belt. But while van der Weyden’s subject is a lovely woman waiting for her sitting to be over, Memling’s old woman seems beyond time. Her face is modeled in smooth, light, warm tones–except for the eyes, which are sharp darks, and look inward. The whole face, in fact, seems to look inward. Memling enhances this stillness by the rigor of his design. Her pose is a sharp-edged pyramid rising from the bottom of the canvas. The shapes are clear and stable but not uneventful: her headdress has several very sharp and simple edges, but just as the eye is about to get bored there is some tweak or flurry which is all the more involving because it is so delicate. Follow any shape, any edge, you find the same subtlety. Nothing is just hogged in. The view out the window–a road, a house, a few trees–provides a bit of lively texture to contrast with the broad simplicity of the primary shapes, and also hints at her world.